I am super happy and super surprised to now have 150+ followers - it makes me feel all warm and squishy. To celebrate all you lovelies (and the many others who subscribe via feedreaders and email), I am giving away a copy of the phenomenal Matched. 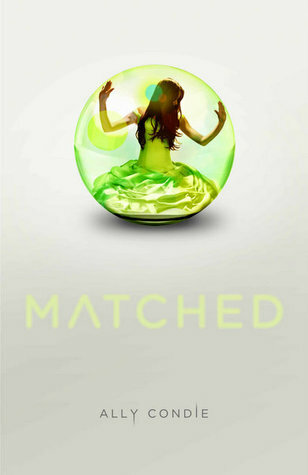 You can find my review of Matched here. It is safe to say that it is one of my stand-out reads of 2010. To enter, all you need to do is comment on this post sharing what your favourite poem is and why (making sure that I know how to contact you if you win). The giveaway is international and will run until 1st December 2010.
don't enter me in the giveaway - I've already pre-ordered my copy! Thanks for the giveaway! My favorite poem is The Raven because it's creepy and written by Edgar Allen Poe and I love him! My favorite poem is from ages ago, called The Little Orphan Annie poem by James Whitcomb. Thanks for the giveaway and congrats on 150 followers! My fav poem is the Raven by Poe. It always gives me the chills. My favorite poem is Goblin Market by Christina Rossetti. I'm not sure exactly why I love it. There's something very mysterious about it that I find compelling. Thank you go the chance to win! Awesome Contest!... and Congrats on 150 follower! My favourite poem is 'I Love A Sunburnt Country' by Dorothea MacKellar. I love this poem because it's about Australia and everything she missed about it when she moved back to England. It describes the Australian landscape in great detail, too. My favourite poem is "Nothing Gold Can Stay" by Robert Frost or "Blue-Butterfly Day" for that matter, I just can´t decide! My favourite poem would have to be Preludes by T.S. Eliot. It was one of the first poems I've studied in school and served as the prelude to me falling in love with poetry from that point on. Also, there are some recognisable lines within the poem that can be found in Andrew Lloyd Webber's Memory (from the Musical Cats) which was basically adapted from Eliot's works. And Memory, as it is, happens to be my one of my favourite songs. Mostly, I love this poem because it captures and expresses the emotional exhaustion of the disillusioned and lonely souls living lonely lives in an essentially sordid and decadent culture. Congrats for your followers! I've always liked your blog and your reviews, they keep me up-to-date with new books and are always nice! have patience with everything unresolved in your heart and to try to love the questions themselves as if they were locked rooms or books written in a very foreign language. Don't search for the answers, which could not be given to you now, because you would not be able to live them. And the point is, to live everything. Live the questions now. Perhaps then, someday far in the future, you will gradually, without even noticing it, live your way into the answer. Perhaps you do carry within you the possibility of creating and forming, as an especially blessed and pure way of living; train your for that - but take whatever comes, with great trust, and as long as it comes out of your will, out of some need of your innermost self, then take it upon yourself, and don't hate anything. It's from Rilke and I like it because it give deep insights on life, on how we should live...I find it suits me and when I'm a bit confused or tired or I don't know what to do with my life I read it and it makes me feel better. I can't wait to read this book! My favorite poem is Still I Rise by Maya Angelou. It's too long to post, so google it! Thanks for the giveaway! Thank you :D Not really a poem girl, but anyway, Sonnet 18 by William Shakespeare grew on me after having to read it for million times and overanalyse the poem for school. :D I think that's my favourite poem. Why? Uhm, because I read it too many times, and I have to overanalyse it for school, and I think it's romantic and quite a genius, immortalising his lover in this way. Wow! Thanks for the contest. My favourite poem is 'Daffodils' or 'I wandered lonely as a cloud...' by Wordsworth. It's such a beautiful, vivid poem yet it's about more serious topics like individuality and marginalisation. I honestly don't know many but I do like The raven written by Edgar Allen Poe. Great giveaway thank you very much for the chance! I don't know which is my favorite, but e.e. cummings - i carry your heart with me is really nice. I love Robert Frost's Stopping By Woods on a Snowy evening because it's an eloquent depiction about life and the choices we make. I’ll be consumed by the fire. My favourite poem is "Porque son niña tus ojos" by Becquer in English it would be "Because of your eyes, girl"
I don't know, I just like it because at the beginning it seems that the poet felt only fatherly love but as the poem progresses, that love seems to be evolving and changing becoming something else. My favorite poem is Canis Major by Robert Frost. It is just such a beautiful and inspiring poem to me, especially since I consider myself a bit of an underdog too.